The Lord of the Rings is a licensed theme that was introduced in May 2012. It's based on the movies by Peter Jackson, which are in turn based on the books of the same name by J.R.R. Tolkien. 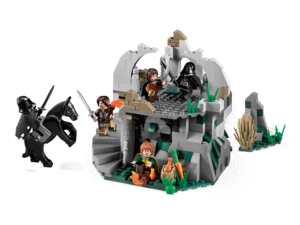 The theme's first wave was released in May and consists of seven sets, based on the trilogy of films, The Fellowship of the Ring, The Two Towers, and The Return of the King. 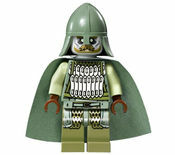 Between the first and the second wave of sets, LEGO The Lord of the Rings: The Video Game was released in November 2012. 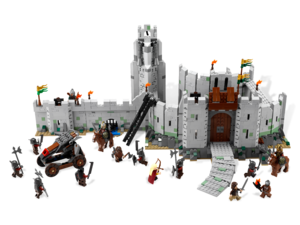 A second wave of sets were released in the summer of 2013, introducing 5 new sets. 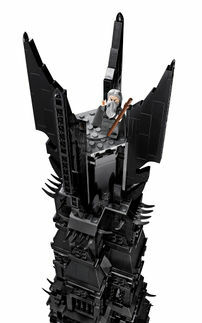 9469 Gandalf Arrives, One of the theme's two vehicle-based sets. The Lord of the Rings currently consists of one main theme, simply branded The Lord of the Rings, although it has three unofficial subthemes, each based on the film after which it is named. 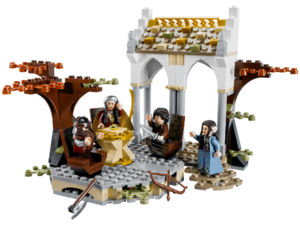 Currently, six of the twelve sets (9469 Gandalf Arrives, 9472 Attack on Weathertop, 9473 The Mines of Moria, 9474 The Battle of Helm's Deep, 79006 The Council of Elrond, and 79008 Pirate Ship Ambush) focus on the heroes of the theme. 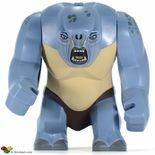 The other six are 9476 The Orc Forge, which focuses exclusively on the orcs, 9471 Uruk-hai Army, in which heroes and villains are approximately evenly matched, 9470 Shelob Attacks, in which the evil spider Shelob is the primary focus, 79005 The Wizard Battle, where the focus is Saruman's Palantír and the battle between the two wizards, 79007 Battle at the Black Gate, which is mainly focused on Sauron's "teeth" which the fiends of Mordor hide behind, and 10237 The Tower of Orthanc, where the primary focus is the tower of Orthanc, owned by the evil wizard Saruman. 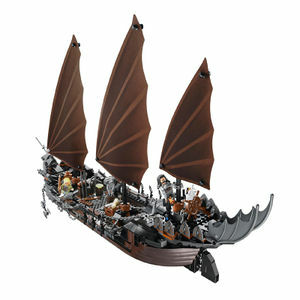 Almost all of the sets are location-based, with Gandalf Arrives and Pirate Ship Ambush being the only exceptions. 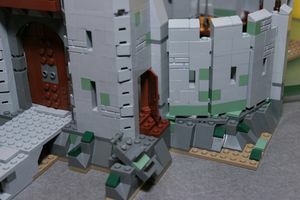 Helm's Deep, featuring light grey architecture with sand green highlights. 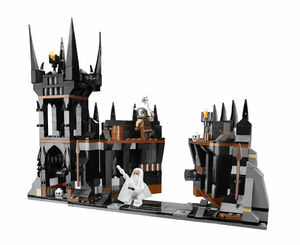 Most of the sets feature a base color of light grey, with dark grey added as an accent in the more naturalistic areas (Weathertop, The Mines of Moria and Shelob Attacks), and sand green being added to the architecture Rohan. 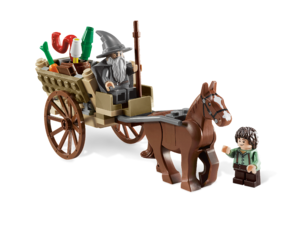 Gandalf Arrives is made up of tan parts for the cart, with a dark grey saddle, reddish-brown wheels and a horse. 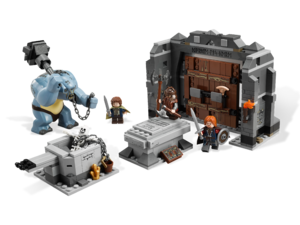 The Orc Forge is mostly reddish-brown, with a base made of tan plates, and grey bricks of both shades. 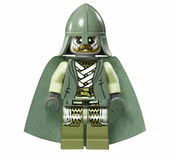 A large amount of minifigures are included in the theme, almost all of which are coloured in naturalistic shades. Gollum is almost entirely tan, Legolas Greenleaf is sand blue, olive green, and reddish brown, all the hobbits wear simple colors, and the orcs are all printed in various shades of brown and green. The theme is based on the film trilogy by Peter Jackson, which is in turn based on the books by J. R. R. Tolkien. The Fellowship of the Ring begins with Bilbo Baggins' 111th birthday. 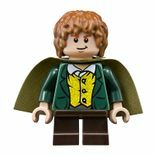 The celebration gives Bilbo the opportunity to give his old ring to his favorite nephew, a young hobbit named Frodo Baggins. This ring, which Bilbo took from Gollum on a previous adventure seems to have strange qualities, however. After Bilbo leaves to live with the Elves in Rivendell, the wizard, Gandalf explains that the ring is actually the One Ring, the most powerful ring of all the Rings of Power made, belonging to the Dark Lord Sauron, and used to dominate all the people of Middle-Earth. 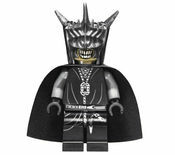 Now that Sauron is attempting to take Middle-earth once again, it must be destroyed to prevent him from using its great power. Frodo left his home of the Shire with Samwise Gamgee, his gardener, upon a quest to reach Rivendell, and seek the Elves' advice in the matter. The two were shortly joined by Merry and Pippin, two young friends of theirs, as they were running from a farmer they had stolen food from. The four were then pursued out of the Shire by three Black riders, and only escaped from them after crossing the Brandywine river. The travelers sheltered at an inn called The Prancing Pony. Under an assumed name, Frodo asked the bartender where Gandalf is; however, the bartender explained he had not seen Gandalf in months. The hobbits did not know what to do, and after Pippin accidentally revealed Frodo's true identity—he had been going under the alias "Underhill"—Frodo fell. The Ring landed on his finger, and the Nazgul, drawn to its power, drew to attack Bree. Aragorn took Frodo upstairs, while the other three hobbits mistook him as a villain. Aragorn then explained them about the Nazgul, and the five left Bree. 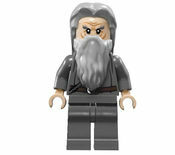 Gandalf went so far as to meet with Saruman in Orthanc. 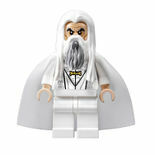 However, upon arriving, it was revealed that Saruman had betrayed him. After a fierce battle, Gandalf had to choose between death and the transition to the other side. He jumped down from the top of Orthanc make it look like he died but the Great Eagles rescued him and brought him safely down. With Aragorn's help, the hobbits narrowly escaped the Riders again, and continued to Rivendell. They are attacked once more by the riders at Weathertop, and although Aragorn battled them off with flaming torches, it was not before the Witch King stabbed Frodo. With Frodo mortally wounded by the rider's enchanted blade, the five fled to Rivendell, and, before they reached there, they encountered the Elf Arwen, Aragorn's childhood friend and lover who sped Frodo ahead to Rivendell, attempting to outrace the riders. Arwen and Frodo finally escaped when she summoned a flood of water that swept their pursuers away. After waking up in Rivendell, re-encountering Gandalf, and realizing that Bilbo is still living there, Frodo, along with his comrades, attended the council of Elrond. There they meet Boromir the man, Legolas the Elf, and Gimli the dwarf. The council discussed the ring, and, Gandalf and Elrond reveal that the Ring can only be destroyed by the fires at the heart of the volcano Mount Doom, where it was forged. The council decides that a fellowship shall go out together in an attempt to reach Mount Doom and destroy the Ring. The full Fellowship of the Ring, consisting of Frodo, Sam, Merry, Pippin, Aragorn, Gandalf, Legolas, Gimli, and Boromir, set off. They are stopped by the magic of the wizard Saruman, and are forced to journey through the dwarven Mines of Moria. Unbeknownst to the Fellowship, the Dwarven company led by Gimli's cousin Balin were no longer living in the mines and the dwarves were long since dead as accounted by the last page in the book of Mazarbul. Pippin the hobbit, being careless, knocked a skeleton into a well which was attached to a shackle of chains that made a huge rattling throughout the mines, alerting the inhabitants to the Fellowship's presence. Enraged by the sad tale, Gimli, along with the rest of the Fellowship, took a stand against the now approaching Goblins and did combat with them and a Cave Troll. After being chased by a gigantic creature known as the Balrog, the party attempted to escape the mines. Gandalf seemingly defeated the Balrog by forcing it into an extremely deep crevasse, but was pulled in with it. After the remaining Fellowship escaped the mines, the eight were separated by another battle. Merry and Pippin were captured by a band of Uruk-Hai, Boromir was killed by Lurtz, and Frodo and Sam decided to continue with the ring on their own, so as not to endanger their friends. Aragorn, Legolas and Gimli pursued the Uruk-Hai that had taken Merry and Pippin. 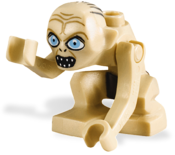 In the beginning of the second film, Frodo and Sam encountered Gollum, a corrupted hobbit-like creature who had craved the Ring ever since he had lost it. After capturing him, he grudgingly became their guide after Frodo threatened him with his sword, Sting. After this Gollum always called Frodo "Master". Gollum led Frodo and Sam through the Dead Marshes, to the very door of Mordor even, but then having turned back, the party was captured by Faramir. However, on hearing news of his brother Boromir's corruption at the hands of the Ring, Faramir lets them go, to accomplish their task. Gimli, Legolas, and Aragorn continued their chase of the Uruk-hai that had taken Merry and Pippin. Shortly thereafter, they met the Riders of Rohan and their leader, Éomer, who told them that King Théoden of Rohan was possessed by Saruman, and had exiled him. The Riders had also, apparently, encountered a band of Uruk-hai, and killed them and supposedly the hobbits as well. The pursuers then set off, and, after some searching, Aragorn found the hobbit's trail again, leading into Fangorn Forest. 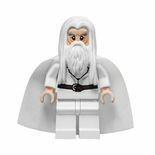 They did not find the hobbits, but encountered Gandalf, who had defeated the Balrog, and became the new white wizard, replacing the corrupt Saruman. After the party rode to Edoras, Gandalf freed Théoden from Saruman's control, and Gríma Wormtongue, the king's former ally, and a spy of Saruman living in Edoras, is thrown out. 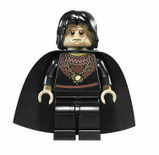 Wormtongue then fled back to Saruman and Isengard. Merry and Pippin turned out to have escaped from the Uruk-hai and met Treebeard, an Ent who saved them from Grishnákh, an Orc who followed the Hobbits into Fangorn Forest. After a long Entmoot, the Ents disagreed with Merry and Pippin's plan to attack Isengard. Soon after that, when Treebeard was carrying the Hobbits close to Isengard, as they wished, he discovered that the havoc Saruman had wreaked on their beloved forest. Afterwards, he called for the Ents, and they launched a successful attack on Isengard, almost utterly destroying it, and kept Saruman as a prisoner in Orthanc. Aragorn, Gandalf, and company, then proceeded to Isengard, where they met Merry and Pippin. Pippin found the Palantír of Orthanc and after seeing a vision of Sauron's plan in it, Gandalf and Pippin rode to Gondor to warn the people of an impending attack. 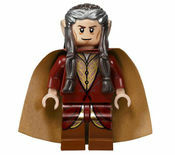 The steward Denethor refuses because Aragorn rides with Rohan. Pippin lights a War Beacon, and around Gondor more beacons get lighted, until one is close to Edoras. 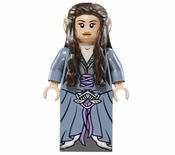 Aragorn sees this, and tells Théoden that Gondor calls for aid. Théoden agrees and calls the Rohirrim. Meanwhile, Faramir retreats from Osgilliath. Madril (Faramir's Second-in Command) was left behind and was killed by Gothmog. Faramir and an army of Gondorians are send on a suicide mission to reclaim Osgilliath. Everyone except an unconscious Faramir was killed in battle. Denethor thought Faramir was dead, and tried to burn him alive. Denethor then saw the titanic forces of Mordor destroying Minas Tirith. This drove him mad, and he commanded the Gondorian defenders to flee. Gandalf then subdued the mad steward and successfully rallied the defenders, using trebuchets to destroy the siege towers and trolls. Meanwhile, at the Rohirrim encampment, Elrond gives Aragorn the ancient sword of Andúril, forged from the shards of Narsil (Sauron's Doom) with which to win the allegiance of the Army of the Dead. Pippin, with the aid of Gandalf, saved Faramir from a funeral pyre, and Denethor set himself on fire in rage and leapt off the pinnacle of Minas Tirith. The Orcs attacked Minas Tirith, and a mighty battle took place, with the assistance of the Rohirrim. But even then, the city was only saved by the timely intervention of Aragorn, Legolas, Gimli, The King of The Dead and the army of The Dead on the ship of the pirates. 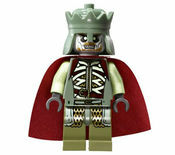 Théoden was tragically killed by the Witch King, but Éowyn and Merry then killed him. The victorious army then proceeded to the Black Gate , outside Mordor, in the hopes of distracting Sauron, so that Frodo and Sam can complete their mission. Instead of Sauron, someone else came, representing Sauron (Mouth of Sauron). Aragorn, Legolas, Gimli, Merry and Pippin finally managed to attract the attention of Sauron and destroy the Mouth of Sauron. 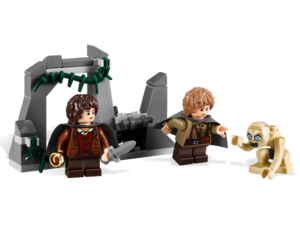 Frodo, Sam, and Gollum reach the Black Gate of Mordor, but cannot enter, as they are too heavily guarded. Gollum leads them up through a secret path into Mordor, but, after Sam grows suspicious of his action, tricks Frodo into abandoning him. 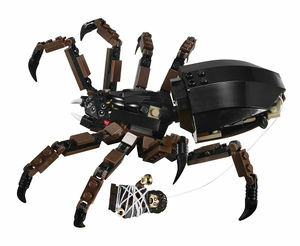 Gollum then leads Frodo into the lair of Shelob, a gigantic spider, in the hopes that, once she killed Frodo, he could take the Ring. Sam fended off Shelob, but she still managed to inject Frodo with venom and cocoon him, which put him into a comatose state. Orcs arrived and brought Frodo to their tower, forcing Gollum to flee. Sam arrived at Cirith Ungol, finding most of them dead at their own hands, after arguing over Frodo's Mithril coat. Sam then freed Frodo, and, together, they finally reached Mount Doom. Frodo was about to destroy the Ring, but, realised that he couldn't. The Ring's power over him was too strong. It was at that point when Gollum ambushed them. Gollum took back the Ring by biting off Frodo's finger, but overbalanced on the edge of the cliff leading into the volcano's fiery interior, and perished, along with the Ring. The destruction of the ring also caused Sauron's destruction, creating a massive earthquake, that eradicated the enemy forces on the plains of Gorgoroth, with only a few thousand members of Sauron's army escaping. Aragorn and the other members of the Fellowship survived this earthquake as well. The remainder of the Fellowship was thus reunited, and the hobbits returned to the Shire. 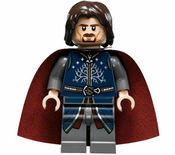 Aragorn was crowned king of Gondor, with Arwen, Elrond's daughter and his lover long ago as his wife. Frodo wrote about his adventure in the remaining pages of the book about Bilbo's story, but, eventually, set off with Elrond, Galadriel, Celeborn, Gandalf, and Bilbo to the Undying Lands, and left Sam to finish the story. The theme introduced a new piece to represent The One Ring. 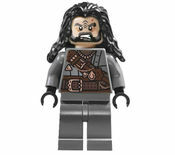 Also, new sword, shield, and helmet pieces for the Uruk-hai, Frodo Baggins' short sword Sting, the Ringwraith's capes, and a new horse mould in which the legs can move (like the Bear from City) were released. 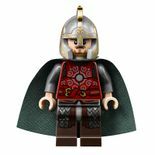 To represent the characters' proper hair and headgear, new pieces include Rohirrim helmets, Gimli's helmet, Elf hair/ears, Orc hair/ears, Hobbit hair, Gandalf's beard, the Cave Troll's entire mould as well as a goblin king and a Gollum minifigure. 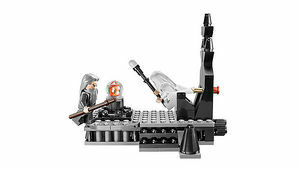 "Our collaboration with Warner Bros. Consumer Products has delivered numerous worldwide successes in the construction toy aisle with lines like LEGO HARRY POTTER and LEGO BATMAN, introducing us to loyal audiences who love great stories, strong characters and the toys that they inspire,” said Jill Wilfert, vice president, licensing and entertainment for The LEGO Group. “It’s particularly exciting to now be able to create sets based on the fantasy worlds and characters from THE LORD OF THE RINGS trilogy and the two films based on THE HOBBIT, not only because we know they will foster collectability and creative play, but also because these are two properties that our fans have been asking us to create for years." Facts about "The Lord of the Rings"